Life with Bethie the Boo: Stripes! Apparently I'm in a striped mood this week. Yesterday was a black and white striped shirt, today it's a black and white striped skirt. It's also another "Pinspired" look that I figured I could duplicate rather easily even being pregnant. Here is the pin. And here is my take on the look. In hindsight I wish I'd chosen a different necklace. This shirt also looks a lot more red in the photos than it actually is. It's much more of an orangy red when you see it in person. Otherwise this is a nice comfy and summery outfit! A little secret too - this was Monday's outfit. My schedule is so goofy this week I knew I wouldn't be blogging outfits on the day they were worn. And that's ok every now and then! Also, this is another outfit made entirely of non-maternity pieces. Yay for stretching out my own closet and yay for stretchy waistbands! Today is my last working day this week before my cabin weekend. I get the feeling it could be rather hectic, so I'm glad this was planned ahead of time! I also have to share a picture of my mosaic from last night - the class was a lot of fun! I still need to grout it after the glue dries, but here is the general idea - I made a mirror for the baby's room. That a super cute outfit! I LOVE your sandals!! The mirror turned out really cool! I'm sure it's going to look neat in the baby's room. I am seriously not sure how I survived before Pinterest. It makes getting dressed so much easier if you aren't feeling like thinking. This re-creation turned out great! Love the way your mosaic turned out too and will be special for the baby. I love that you get ideas from Pinterest all of the time, that is something I need to keep in mind! A longer necklace would have been cute, but the one you have does not look half-bad! I love the frame, how sweet to have something hand-made for the baby! Lurv your take on this pinterest outfit! Your skirt is awesome. I want one! And I think a more solid statement necklace would have rocked the outfit. But the one you have on is NOT a bad thing. :-) LURV the mirror! Can't wait to see the completed work! Your mosaic mirror came out awesome! Love that it's for the baby's room! And the mosaic mirror looks great and it's so great that you have something handmade for the baby's room! Oh such a great post! 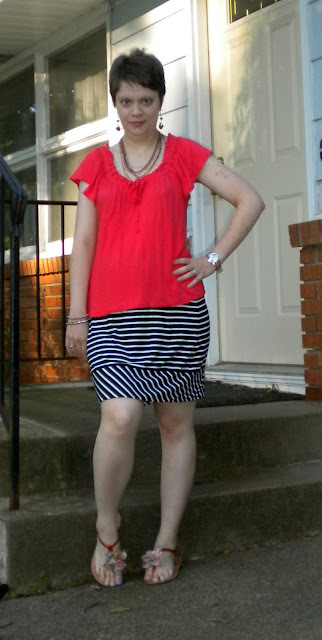 That vibrant color is awesome on you and the stripe skirt is great. Thanks for your compliments on the tutorial and for the vote of willing to trying. That's is super great!!! Take care, girlfriend! I like your outfit, especially your skirt! And I think the baby's going to love that mirror! I was totally wearing that outfit last night!!!!! Red and stripes are great! Cute outfit, Beth. I love the red with the stripes. This is a totally cute look! I love the striped skirt and bright shirt. Awesome job on the mirror! What a fun piece to make. My mom once made something like that out of found glass.